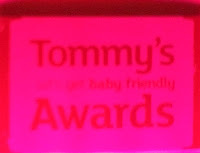 With much excitement, I attended the Tommy's Lets Get Baby Friendly Awards at the Landmark Hotel in London yesterday. Never in my wildest dreams did I think I would ever attend a glittering event in London rubbing shoulders with celebrities. I was there in two capacities. Over the past 10 months I have been working with Tommys through this blog, and in the media. It's been fantastic and I feel they have given me a lot more than I have given them. 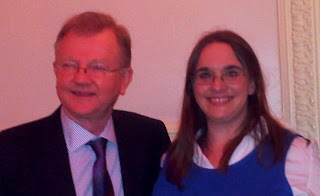 And secondly, I nominated my GP Dr Gordon Mackinnon for the Tommy’s & Danone Baby Nutrition healthcare ‘hero’ award award, and I am proud to announce he won! The Landmark is an amazing hotel and I was struck by how well run the event was, it was simply beautiful. There were celebrities everywhere you looked, but they weren't the real stars of the day. 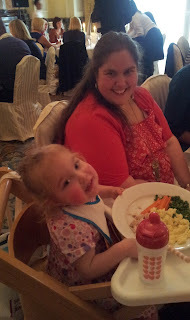 This is Skye (with her mummy Ruth), born at 27 weeks, about 3 weeks before Joseph. Skye is beautiful just like her mummy, with a strong spirit. You can read her story told my her mummy here. The stars of the day were the children, the parents, the healthcare workers and the support staff that make our dreams come true. It is not exaggeration to say that with each story told, eyes got wetter, mascara ran and napkins were used instead of tissues. Particularly moving was Professor Shennan's address about his work with the premature baby clinic at St Thomas' funded by Tommy's. His work in instrumental in helping parents take home healthy happy babies, and he shared several stories of how the research is really improving outcomes, and they are on the cusp of many more breakthroughs to help more parents bring home their babies. This is the very lovely Terri Dwyer presenting an award to my friend Carole's health visitor, Brenda Bartlett for her exemplary care, support and resourcefulness. I do hope one day Carole will share Luke's story here, as its a remarkable one. Those are Luke's tiny fingers. Whilst the stories are moving, and the message behind what Tommy's are doing is important to share, it wasn't all serious. 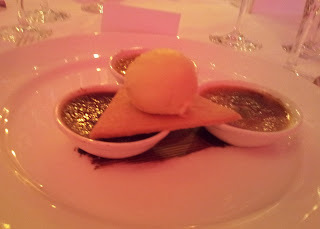 The meal was amazing, and I had to take a picture of the wonderful dessert. Pictured here are 3 creme brulees, a tradional one, a chocolate and a pistachio variety topped with a shortbread and a scoop of rum and raisin icecream! Quite delicious. Here I am with Dr Mackinnon, hopefully offiicial pictures will be available soon. A massive thank you to TKMaxx for supplying my make up, bag and shoes for the event. I know that there is so much pressure to give to charity. I know a lot of us work very hard to provide for our families, and it's hard to find spare cash, but I can tell you, that every little amount you give to Tommy's helps. It helps provide answers, to provide support, to give advice, to share information. You are helping mums like me to be mums. You are helping babies like Joseph to thrive. You are there at the beginning of these tiny lives. Just a friendly reminder that I am running/waling the London 10k for Tommys and would be grateful for any donation. Sounds like a very important and memorable event and yes that dessert looked delicious! Wow I have regularly read your blog I came across it one day when I was looking for stuff about premature babies. Mad to think I was there at the event with you and didn't even know lol! I am Olivers mummy. Wow looks fantastic, and to nominate your GP only for him to win, you both must have been delighted. Lovely to read about it here, thanks. congratulations award in the region. Glad you had a wonderful day I really enjoyed it last year as a parent of a champion child.